Air Force Space Command (AFSPC) on June 4 released a request for sources able to produce up to 22 GPS III spacecraft — an effort to assess the industry’s capability to replace both Lockheed Martin, the current prime contractor, and Exelis, the subcontractor responsible for the navigation payload. That payload — and consequently the GPS III satellites themselves — has been significantly delayed, much to the ire of the Air Force. The original $1.46-billion contract let in 2008 anticipated launch of the first GPS III by this year. And, indeed, for the first few years the Lockheed team was running ahead of schedule. However, Exelis — which in a previous corporate incarnation as ITT Space had a lead or contributing role in building all of the GPS navigation payloads — found itself unable to produce the GPS III version with the new civil GPS L1C signal and multiple legacy signals within the original timeline. Numerous U.S. aerospace companies responded to the AFSPC solicitation, as well as at least one foreign company. “Obviously we want a GPS III that does what its supposed to do, delivered on time,” Lt. Gen. Ellen Pawlikowski said at a press briefing during this year’s National Space Symposium, Defense News reported. Until recently, Pawlikowski headed the AFSPC’s Space and Missile Systems Center (SMC) at Los Angeles Air Force Base home of the GPS Directorate (GP). SMC/GP intends to create a competitive environment through a two-phase process for producing up to 22 GPS III satellites after the first eight for which Lockheed has already been funded. Phase 1 entails award up to two Production Readiness Firm Fixed Price (FFP) contracts in Fiscal Year 2015 (FY15) that would conduct space vehicle (SV) and navigation payload critical design review (CDR) with demonstrations and qualification of the SV subsystem boxes. Phase 2 would be a limited competition between Lockheed Martin and the selected contractor (or contractors) for up to 22 GPS III production SVs. An award for those satellites is anticipated in the FY17/18 timeframe to support a first SV available for launch no later than the first quarter of FY23. Perspectives as to the AF’s intentions for the new solicitation vary widely among aerospace and defense experts. Some see it as merely a shot across Lockheed’s bow to indicate official dissatisfaction with the delays, some as a real opportunity for new entrants into the program, others as cover for a reworked Lockheed design for the GPS IIIs. Opportunity for New SV Design? 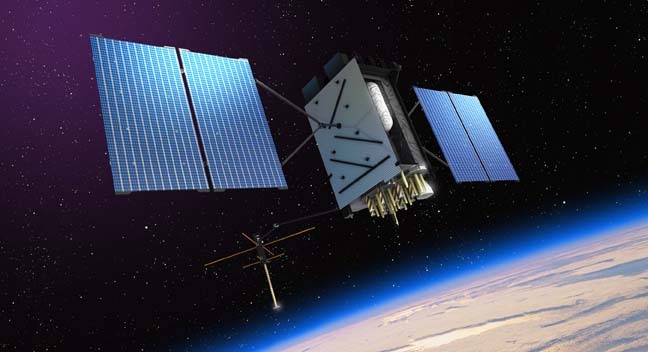 Although the “sources sought” announcement indicates that military officials are looking for a production contractor and not one to tackle a development program, experts tell Inside GNSS that broader changes are being weighed. Everything is in flux, said one well-informed source, who compared the pace and search for solutions to the sort seen during wartime. The GPS III solicitation had a deadline for responses of less than two weeks after publication of the announcement. The expert, like the others who discussed the contract situation, spoke on condition anonymity in order to be able to discuss the program freely. Among the options being assessed, another source said was launching at least some of the GPS satellites without the nuclear detection payload — an idea that has been floated before. “There is a very strong possibility that a new GPS III without the (Nuclear Detonation Detection System [NDS]) on it could, in fact, be built,” said the expert. What makes it possible, this expert said, was that enough satellites with the NDS payload would be on orbit after the 12th GPS III spacecraft is launched to fulfill the nuclear detection mission through 2040 — making it unnecessary to loft more. Pulling NDS from some of the GPS III satellites could allow dual launch of those spacecraft — at a significant cost savings. Though the Air Force announced earlier this year that it would not pursue dual launch, the GPS Program Office is keeping the capability in its plan for the spacecraft, explained the source, so that the option is available later if needed. One of the conditions under the potential new contract is that the provider of the navigation payload be a firm other than Exelis. Although other U.S. firms might be able to provide that capability, sources suggested, the Air Force may be contemplating looking even farther afield. The American arm of Europe’s Surrey Satellite Technology Ltd. (SSTL), manufacturer of the Galileo navigation payloads, is certainly willing to discuss the opportunity. “We are very interested in the alternate source GPS III activities and looking to undertake studies and add value to whatever team we might be able,” said Douglas Gueller, the chief operating officer for SSTL’s U.S. subsidiary. His firm has manufacturing facilities in Denver, he said, and is now executing it first missions in the United States— which include payloads for the Air Force and JPL. One U.S company likely to have the necessary expertise is Ball Aerospace — which would also be happy to step in. “Ball Aerospace seeks to assist the Air Force with affordability for GPS by leveraging its strong navigation payload capabilities,” said Roz Brown, Ball media relations manager, in response to a query on the announcement. “Boeing continues to believe there are affordable low-risk alternate GPS solutions, and looks forward to supporting the Air Force in the Sources Sought process to best meet the future warfighter needs,” said Paula Shawa, spokesperson for the company’s Communications, Space & Intelligence Systems division in a statement. Northrop Grumman has submitted a response to the Air Force, confirmed spokesman Lon Rains. Space Systems/Loral, now known as SSL, wants to be counted in, although it has not yet stepped forward officially. “SSL did not submit an RFI response for GPS 3 but that does not indicate a lack of interest in offering the USAF a low cost commercial bus solution,” said Chuck Cynamon, vice president for business development at SSL Federal in an emailed statement. Lockheed Martin and Exelis are hardly out of the picture, however, and have recently had some success with the navigation payload. Lockheed has closed its Newtown, Pennsylvania, facilities where the GPS III satellite was developed, with about 350 of those employees relocating to company sites in Sunnyvale, California, and near Denver, Colorado, where components will be manufactured and the satellites will be assembled. ““We plan to deliver the first GPS III satellite at the end of 2015,” he said.